Marie Gulich powers past Dani Milisic for the basket. Photo by Marvin Jimenez/TG SportsTV1. Los Angeles, Calif. – The No. 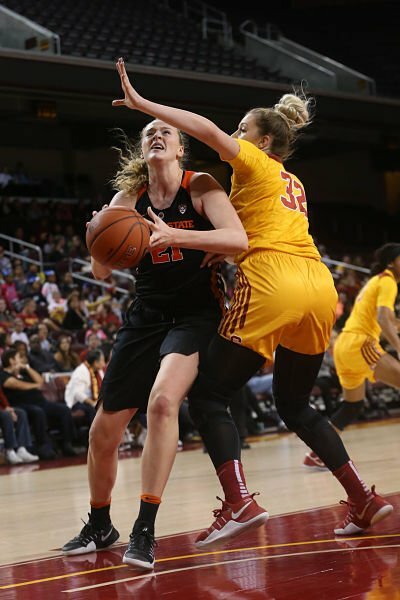 10 Oregon State Beavers notched another win Sunday, defeating Southern California, 74-60. Kolbie Orum came off the bench to score a career-high 16 points and grab nine rebounds for the Beavers, while Marie Gulich added 11 and Breanna Brown and Mikayla Pivec each scored 10 points. OSU came into the contest looking to avenge Friday’s loss at the hands of the No. 17 UCLA Bruins, which snapped their 12-game winning streak. 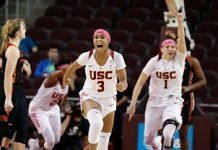 Despite that, it was USC that jumped out of the gate early, scoring the game’s first two points en route to a 10-7 lead midway through the opening quarter. 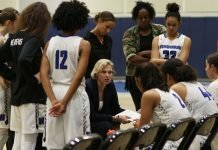 However, that also marked the only highlight of the day for the shorthanded Women of Troy, as from that point onward, the Beavers proved why they are worthy of their ranking. Utilizing a series of runs, OSU soon took a 32-22 lead, and the Trojans made their own run to trim that lead to seven at halftime. The second half proved to continue the narrative for the Beavers. After a Sadie Edwards layup drew USC to within five, OSU scored the game’s next 15 points. They inflated their lead to as much as 20 points in the last period, and the Trojans were not able to keep up. Edwards led the Trojans with 17 points in 40 minutes of play, and Courtney Jaco added 13. Following Friday’s loss, OSU coach Scott Rueck was impressed with Sunday’s response, which included shooting an impressive 51 percent from the field. 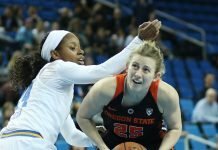 The win was the fifth conference win of the season for the Beavers – a statistic that Rueck does not take lightly in a tough Pac 12 conference. The loss was USC’s fourth straight. They played nine against OSU and started three freshmen because three players are out with injuries, and leading scorer and rebounder Kristen Simon has taken a leave of absence for personal reasons. “We’ve had several different rotations, and we’ve pretty much tried every combination we could,” coach Cynthia Cooper-Dyke said. But Cooper-Dyke noted the team’s improved effort from Friday’s match up. The Trojans will have a short turn around this week, as they host rival UCLA on Wednesday.